Social media powers most businesses if you are not harnessing it, you are behind your competition. Add This is one of the largest and best services for putting your customers closer to your social media reach. With our new module you can not only display the social sharing buttons on the product pages, you can take advantage of their Welcome Bar and Smart Layers also. 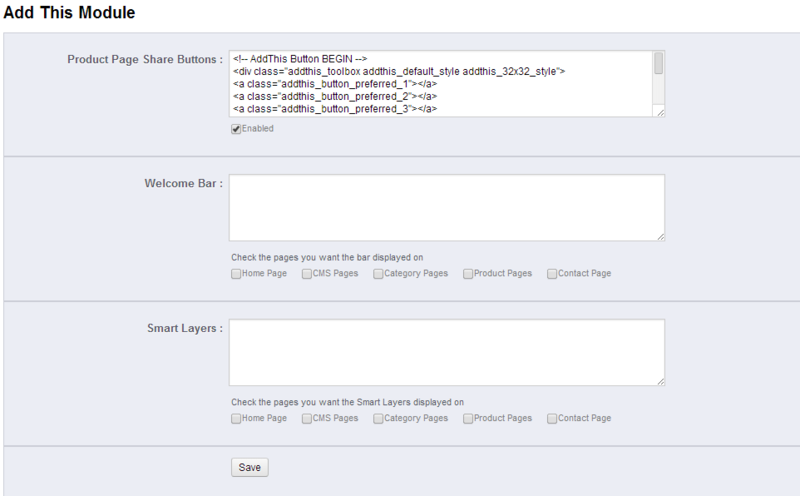 The module is configurable to let you chose what type of pages you want the Add This widgets on as well. This module functions very simply, first you need to install the module. After you install the module you need to go to Add This’s website and configure the sharing services the way that you want them configured. Once they are configured you will get a code to paste into the module. That is it, you will start noticing more sharing and interactions from your customers. Below are a couple of images of the module. This module will allow you to install several different addthis social sharing features on your site. It allows for both main site installation and product page installation. To install this module, simply upload the module from the modules page in the back office of your PrestaShop installation. Once it is uploaded you will be able to install and configure the module.